Is there room for another medical drama in primetime? Has the New Amsterdam TV show been cancelled or renewed for a second season on NBC? The television vulture is watching all the latest cancellation and renewal news, so this page is the place to track the status of New Amsterdam season two. Bookmark it, or subscribe for the latest updates. Remember, the television vulture is watching your shows. Are you? 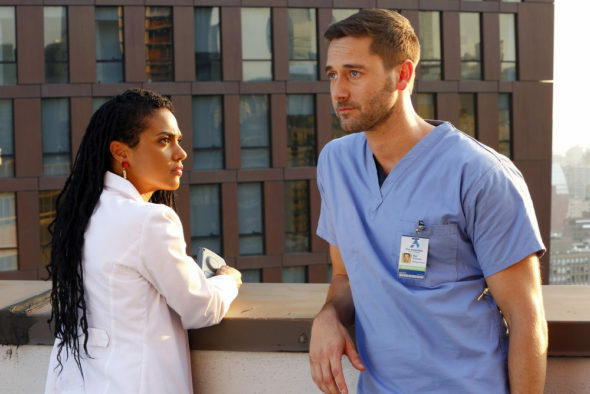 Airing on the NBC television network, New Amsterdam stars Ryan Eggold, Freema Agyeman, Janet Montgomery, Jocko Sims, Anupam Kher, and Tyler Labine. Doctor Max Goodwin (Eggold) is a caring and charming physician whose goal is to fix a broken medical system and to provide exceptional care to the people who need it most. He inspires (almost) everyone around him, and will stop at nothing to breathe new life into the understaffed, underfunded and underappreciated New Amsterdam hospital. The first season of New Amsterdam is averaging a 1.11 rating in the 18-49 demographic and 6.02 million viewers. Find out how New Amsterdam stacks up against other NBC TV shows. New Amsterdam has been renewed for a second season which will debut TBD. Stay tuned for further updates. Will NBC cancel or renew New Amsterdam for season two? The ratings are still pretty strong (compared to other network shows) so this series looks safe for now, particularly since the network ordered a full season of 22 episodes. I’ll keep a hungry on the ratings and update this page with breaking developments. Subscribe for New Amsterdam cancellation or renewal alerts. 2/4/19 Status Update: NBC has renewed New Amsterdam for a second season. Find more New Amsterdam TV series news or other NBC TV show news. What do you think? Are you glad that the New Amsterdam has been renewed for a second season? How would you feel if NBC had cancelled this TV show, instead? What happened to the doctor’s pregnant wife? Why is she noticeably absent? Would like more information about when season 2 of New Amsterdam will air. My husband and I love this show and are eagerly looking forward to watching each new episode every week. Can’t wait!! I love the show. This show isn’t like other hospital shows …NO WHERE NEAR!!! It’s real, refreshing, and realistic. It makes you laugh and cry at the same time. I have recorded the episodes so I have something to hold on to if it gets taken off the air. I’m seriously hoping you keep it on air. I look forward to seeing it every week. Is The Village replacing New Amsterdam? When is the next New Amsterdam Going to air? These 2 shows can’t air in the same time slot? I love the show and was sooo disappointed last week when it was not on! I DO HOPE IT IS RENEWED!! !